Pre launch boat preparation was completed a few days ago and the boat is now in the water awaiting our first trip on April 15. The next few days will be spent loading fishing gear and reinstalling our electronic navigation and sonar instruments. Every season I tell myself that I do not need all of the tackle I think I need and I vow to reduce the boxes of spoons, stick baits flashers and dodgers that I carry. However, as good as my intentions might be, I just can not leave anything behind. 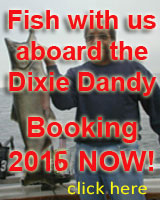 Even though the lower cabin of the Dixie Dandy is the seasonal home to some lures that have not been in the water for several seasons, you never know when they might be needed. I mean come on, what if I get a call telling me that the blue/pink striped version of the â€œwonka rattlerâ€� is hammering the fish. If I did not have a few on board, I would be devastated. One must be prepared, should the day of the â€œwonka thingâ€� come again, even though it has been 10 years since its glory days. I guess having all that tackle on board is like a security blanket. 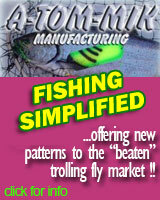 I have been reading a lot of fishing articles looking for some new hot setups for the coming season. There are tons of good â€œhow toâ€� articles out there, except for one thing, the disclaimers. What do I mean by this? Well, for example, one article sang the praises about using small lures, the mini spoons were just what the doctor ordered when all else failed. Now here is the disclaimer, the small lure program worked great except on days when the fish wanted bigger lures. Huh, I thought small lures were the key? Well on certain days they were, on other days they were not. Another story about fishing in bright sunlight sang the praises of black and purple colored lures as a real killer, except when it did not work so well and in fact worked better on overcast days. What fishing articles present is a suggested scenario. 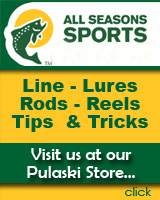 What the angler must do is determine which scenario is working best on a particular day. It is about constant adjustment until a steady bite is achieved. Put a lure out and leave it out all day is nice if the fish will hit it; other wise it is 10 minutes in the water and if no action occurs, itâ€™s time to change. It can be a lot of work. If you are on a charter and the action is slow and the crew is not constantly changing set ups, you are on the wrong charter. This year the Oswego Marina is being renovated. A new bath house /rest room and laundry facility will be built on the north side. That is the side where my boat is docked. The south side already has a new sea wall, and new docks will be installed in a few days. The south side will also receive a new state of the art fish cleaning station and a new deck and well lighted roadway. Oswego Marina is going to be a first class facility, one of the nicest on Lake Ontario. Yes sir, good things are occurring within our fishery and its infrastructure. It wonâ€™t be long now until the most famous words in Lake Ontario trolling are spoken,â€� Gentlemen start your downriggersâ€�. Vha-room, vha-oom. YEAH!!!!! !